One recipe we use at least a few times each summer is my modification of the Potato Salad from Betty Crocker’s 40th Anniversary Cookbook. Peel, dice, and then add rinsed potatoes to a pot of boiling water. Boil until softened (press against the side of the pot to test softness). If you don’t already have hard-boiled eggs on hand, be sure to get those going while you are boiling the potatoes. 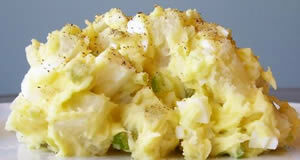 While the potatoes are boiling, add mayonnaise, mustard, vinegar, salt and pepper to a large bowl and mix well by hand. Once the potatoes are finished, drain, and add to this bowl. Stir gently, folding into the mayo/mustard base, so you don’t smash up the potatoes. Add the eggs last and fold those in gently, too. Seal and allow to cool in your refrigerator for at least a few hours. Then serve it up with your favorite summer foods from the grill. There will be many happy mouths and tummies!